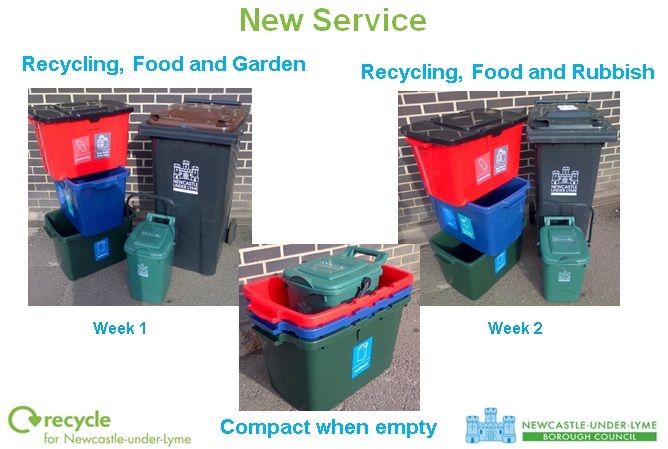 The Newcastle-under-Lyme Borough Council Recycling and Waste Collection Service is changing! From 4th July 2016, the current service will be replaced by a new weekly recycling service. The new service is made up of 3 boxes which will replace the current bag-based system. This will make storage of recyclable materials easier for residents as the boxes will be emptied more often and will stack. 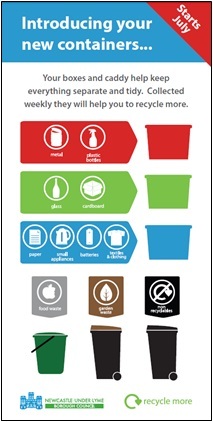 Recycling and composting waste is cheaper than disposal in landfill. 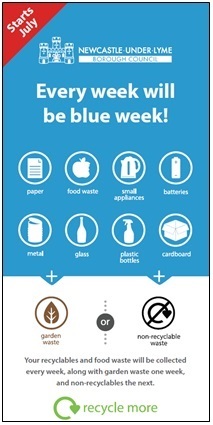 By introducing a simpler system we hope residents will recycle more of their waste. This will cut costs by reducing the amount of waste sent for incineration or to landfill. Councils also have a statutory duty to recycle, with government targets requiring at least 55% of waste to be recycled by 2020. Your collection day is likely to change but we will send details out in June. We are also holding a number of information events across the borough in the run up to the service change. Keep an eye out on our Twitter page (@nbcrecycling) for an event near you and come along if you have any questions.